We are committed to providing the most technologically advanced products and industry best practice services, to deliver cost effective, clean, green energy to South Australian residential and commercial clients across our beautiful state. · Solarspot is an established, leading solar energy company based in Adelaide, South Australia. · We have over 20 years experience working in the renewable (solar) energy industry. · We are a specialist company, only working in solar energy, so our knowledge and expertise is unrivalled in SA. · We have a broad range of expertise, encompassing technology, installation and project management with the capacity to deliver on both small and large projects. · We are a privately owned company, with a strong and consistent track record delivering solar energy solutions to hundreds of homes and businesses over many years. · Solarspot has grown over the years into a reputable and reliable company and we are here to stay. · We have three divisions to ensure that you receive the best quality service and support throughout your solar energy journey from inital supply, installation and servicing. · We are accredited by the Clean Energy Council of Australia, ensuring we are operating to industry best practice standards. · We are a member of the National Electronic Communication Association, (NECA) ensuring we are informed and up to date with changing government policy and legislation. 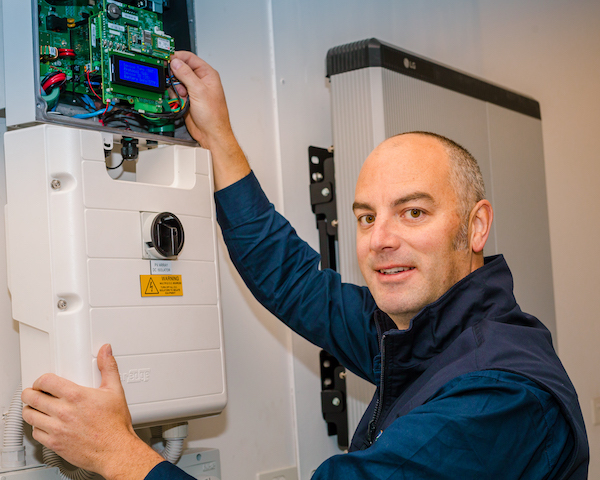 Jason is passionate about renewable energy and has been working in this field for over 20 years giving him a deeply informed understanding of solar energy applications and how best to make them work for his clients. He has a multi-skilled and diverse professional background, with an honours degree in mining engineering and is a qualified electrician. He began his working life in high-end electrical installations and has significant project management experience, having overseen substantial international installations, including Prince Charles’ Duchy of Cornwall Estate in the UK, and major commercial projects here in Australia. Jason has an invaluable combination of skills and expertise. He has extensive specialist knowledge and understanding of cutting edge technology, practical project management expertise and advanced interpersonal and communication skills. This unique combination of skills and expertise, ensures that you will have access to the most appropriate technology for your home or business, confidence in the installation and workmanship and the certainty that you are fully informed of your options, the products, the schedule and the budget, in a way that is accessible and easy to understand, allowing you to make informed decisions that will benefit you into the future.